Delivering the sermon at today’s 57th Presidential Inaugural Prayer Service, the Rev. Adam Hamilton called on President Obama to lead by showing humility, by casting a strong, unifying vision that focuses on helping the “marginalized” and by persevering in the face of criticism and discouragement. Rev. 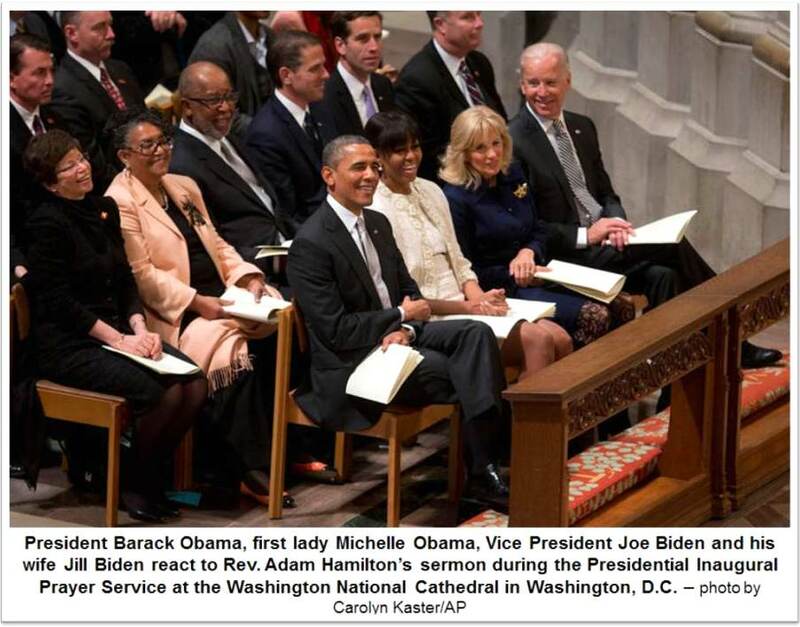 Hamilton is senior pastor of the United Methodist Church of the Resurrection in Leawood, Kan.
President Obama, who did not speak at the event, sat in the front row for the service, along with the First Lady Michelle Obama, Vice President Joe Biden and his wife Dr. Jill Biden. The estimated attendance of the event is 2,200 people. The Rev. Kirbyjon Caldwell, senior pastor of Windsor Village United Methodist Church in Houston, read the Lord’s Prayer at the service. Wearing black robes and speaking calmly, Rev. 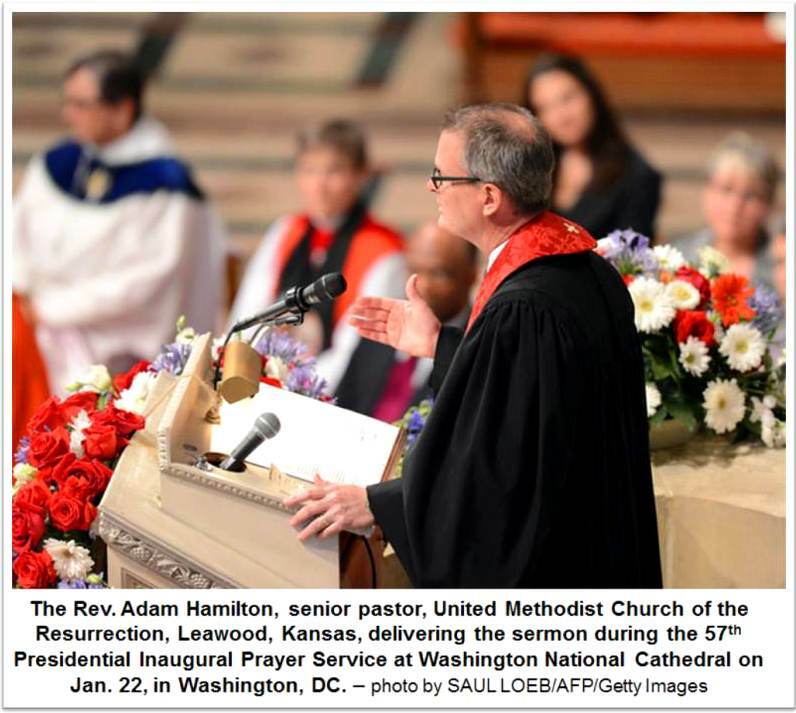 Hamilton delivered his sermon titled “Compassion, Vision and Perseverance: Lessons from Moses,” which weaved the story of Moses along with lessons from Dr. Martin Luther King Jr. and current issues. “Humility and courageous compassion for the marginalized and oppressed are central to the heart and character of Moses and are meant to be central to the heart and character of this nation,” he said. Rev. Hamilton shared how his congregation has worked with the public schools in Kansas City to help 2,284 children in six elementary schools in low-income neighborhoods. Some 2,500 church members have volunteered, building playgrounds, tutoring children, donating books and weekend snack packs, and even providing beds to 300 children who were sleeping on the floor at home. The Rev. Ben Gosden, associate pastor at Mulberry St. United Methodist Church in Macon, Ga., felt those closing words worked on two levels – speaking to the leaders of the nation as well as leaders of the denomination. “It was a perfect call to action for our leaders and for all of us in our local settings,” he said. To read the entire text of the sermon, click here.